Mumma Walker's 7 Years of Pregnancy by CharlieBeth: Smudge Scan! I say "officially" because every measurement I saw the woman take displayed 10 weeks 5 days (I'd worked us out at 10 weeks 3-4 days) so don't know why she settled on 11 weeks 0 days. but never mind, that doesn't matter so much. What matters is little Smudge is alive and well. 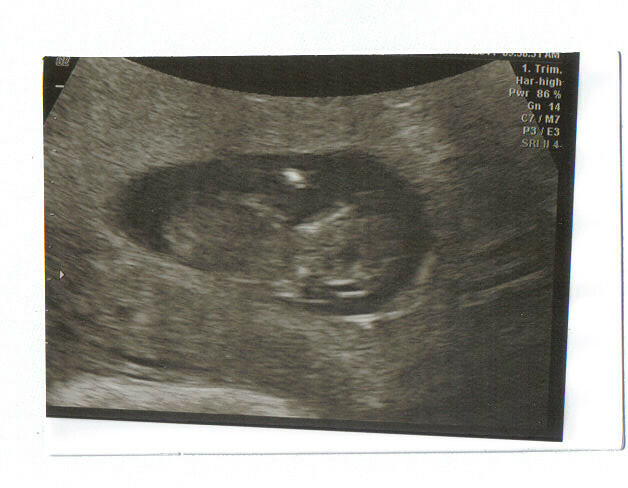 Never mind though, we'll no doubt get a better one at 20 weeks, and if I get checked for GD again then there will be plenty more scans.